Pull together a well-curated look with our exclusive Alexander McQueen bag's mark of distinction: a gleaming skull padlock. 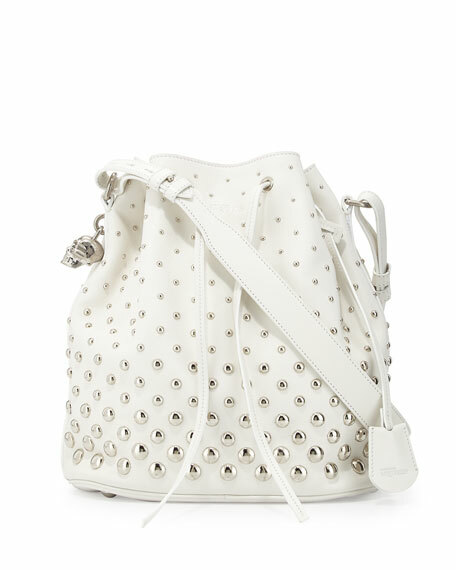 Our exclusive bucket tote bag by Alexander McQueen. Polished calfskin leather; silvertone hardware includes studs that graduate from small to large. Drawstring top; Alexander McQueen signature skull padlock and covered key charm. Buckled shoulder strap has 18" drop. Roomy bucket silhouette holds all the essentials. Inside: one zip pocket, two open pockets, and canvas lining. 12"H x 11"W x 7"D; oval bottom with protective metal feet. Bag weighs approx. 2.5 lbs.